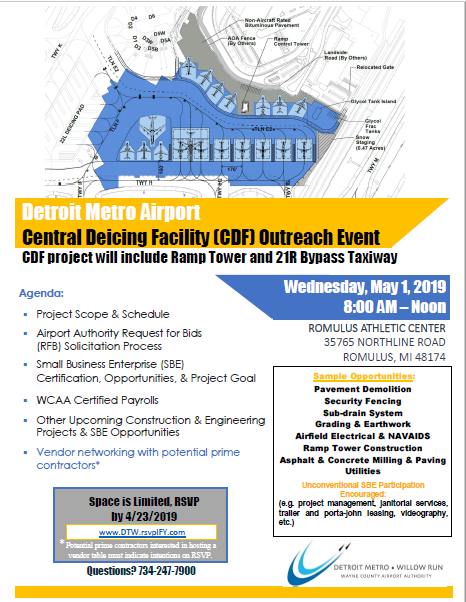 Wayne County Airport Authority (WCAA) is hosting a vendor outreach for the construction of a Central Deicing Facility and Runway 21R By Pass Taxiway at the Romulus Athletic Center on May 1, 2019 from 8:00 am to 12:00 pm. We are looking for SBEs for this project. If you are not currently certified as an SBE, this will be a great opportunity to become certified for future projects at the Airport Authority. You will hear from different departments at WCAA as they explain the components of this project, certification, and the bidding process There will also be a vendor networking session after the presentation for small businesses to interact with prime contractors which could possibly lead to partnerships for future Airport Authority projects.